Two things I know I won't ever get sick of. The song 'Africa' by Toto. And anything that combines peanut butter and chocolate. After Fridays' peanut butter pandemonium, I still had half a jar left. I just happened to have a recipe from the Smitten Kitchen on my 'to bake' list that called for about the equivalent of what was left of the peanut butter. Even if I didn't know that these bars contained peanut butter I would have baked them solely based on the pictures. I think we have all had the traditional Toll House bar/brownies. They are great, Please don't think I have anything against them. But there is truly something extra special about these bars, aside from the fact that they have peanut butter. 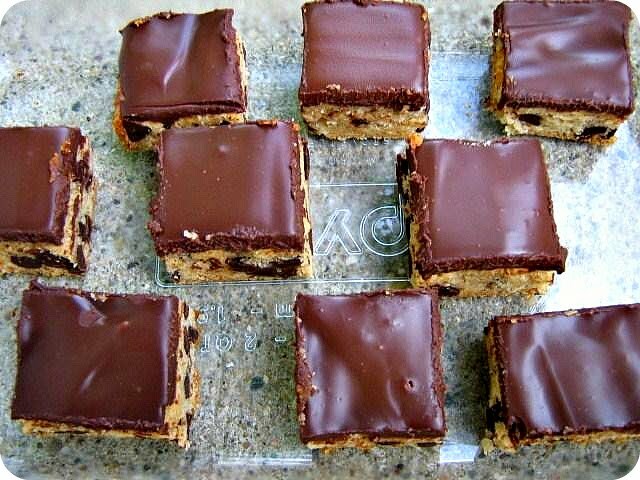 The texture is really more like that of a cookie instead of a brownie or cake. And if you are not a fan of peanut butter, Don't worry, It is very subtle. You just have a delicate hint of peanut flavour. 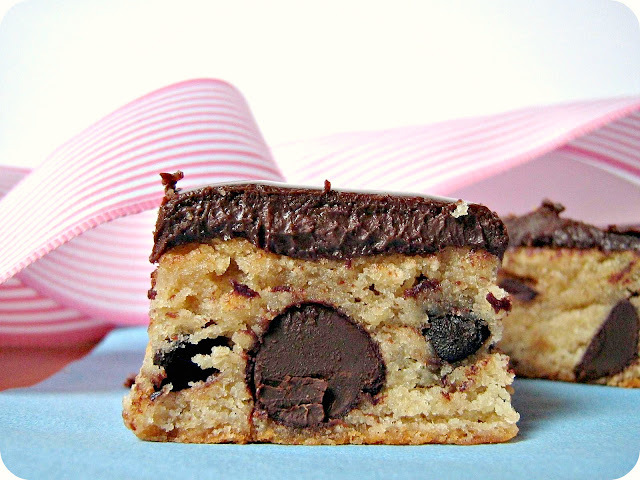 Just enough to make this taste different from the usual chocolate chip bar recipe. I would recommend using dark chocolate chips or chunks. I used Ghirardelli bittersweet chips and I don't think this would be as decadent made with milk or semi-sweet chocolate. I love to push my tongue into a dark chocolate morsel and feel the flavor converge with the smooth texture of the peanut butter base. And the dark chocolate ganache...please. Don't get me started. Words won't, cannot do it justice. It's the perfect crown for this divine bar/brownie/giant cookie. They would be just perfect without the ganache. And maybe you don't want it. But once you try a piece with the sinful halo of chocolate, you will not want the plain version. So why settle for good enough? Preheat oven to 350 F. Grease a 13x9 inch baking pan. Line bottom with parchment paper and grease parchment. In a large bowl, beat together butter and sugar with an electric mixer at medium speed until mixture is light and fluffy ( 1-2 minutes ). Add the sea salt and peanut butter and continue beating until everything is well incorporated. Beat in whole eggs, egg yolk, and vanilla. Scrape down the sides of the bowl. On low sped mix in flour until just combined. Do not over mix. 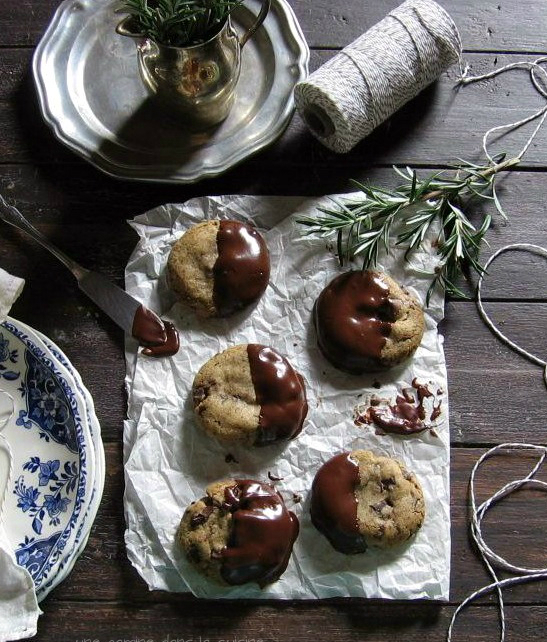 With a large spoon, fold in chocolate chips then spread batter in baking pan, even out the top. The batter will be very think and heavy. Bake for 40-45 minutes or until they turn a deep golden brown. A toothpick inserted in the middle should come out almost clean, only a few wet 'crumbs' should stick. Cool completely in pan on a rack, about 1 1/2 hours. For the Ganache: Pour the chocolate chips into a heat proof bowl and set aside. Heat the cream in a medium saucepan. Add the butter and stir until melted. Heat to just Below a boil and pour over the chocolate. Cover and let sit for about 5 minutes. Stir until all the chocolate is melted and the mixture is smooth and satiny. Pour over the cooled bars and spread evenly. 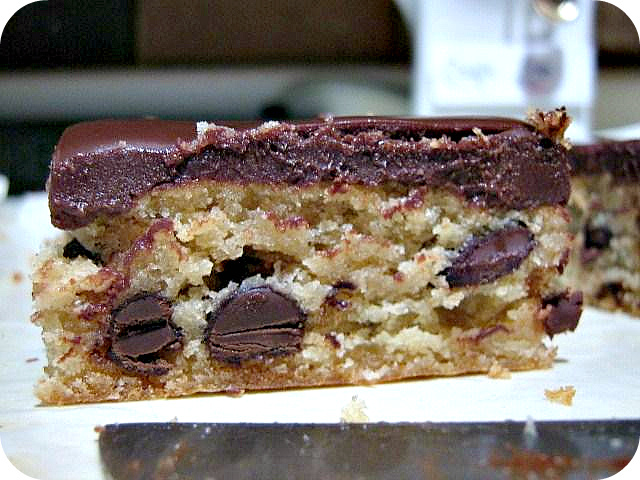 Chill the bars in the refrigerator until the ganache has set. 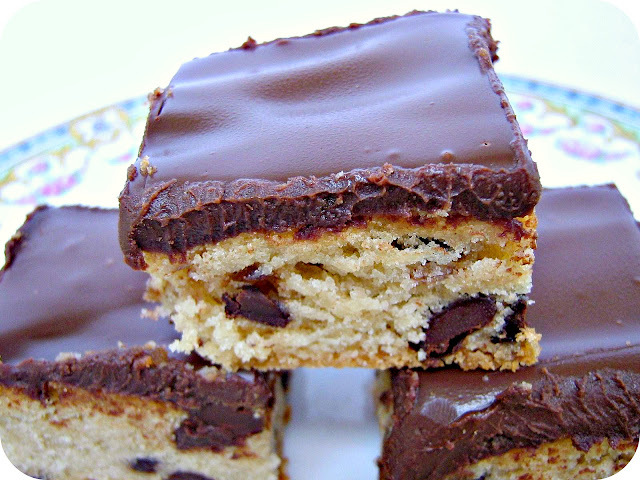 that ganache layer makes these so decadent. well done. who doesn't love peanut butter? I need to bake more with mine and stop eating it off the spoon! 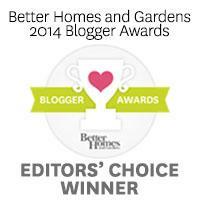 Love your blog, so happy to come by it today. Love that song too. Yes, Milli, I do have to agree with you... off the spoon! YUM! I am looking forward to tasting these little goodies soon! Thanks! These look amazing! I would love to dig into one right NOW!